Banger is a system which uses a very low density technopolymer designed and developed specifically for the MTB sector. It can be inserted into any tire and is easy and fast to assemble (10 seconds) on any type of tubeless-ready rim available on the market. Banger reduces the volume of air inside the tire by 95%, taking the wheel set to a 2.0 level. Shocks are absorbed, vibrations are reduced and feeling and stability increase markedly. Once you’ve added Banger just a few meters are enough to discover totally new features of your bike. Thanks to Banger’s super-light techno compound and its elasticity it guarantees smooth sensations, speed and safety. Banger also provides incredibly efficient “flat prevention”, reducing the risk of punctures or cuts to your tire by 90%. Banger represents a new suspension for your bike. The first sensation of using it when riding is an incredibly smooth and controlled feeling of the wheel set. Right from the smallest obstacles impact energy is absorbed by the elastomeric compound ensuring sensational grip and control. 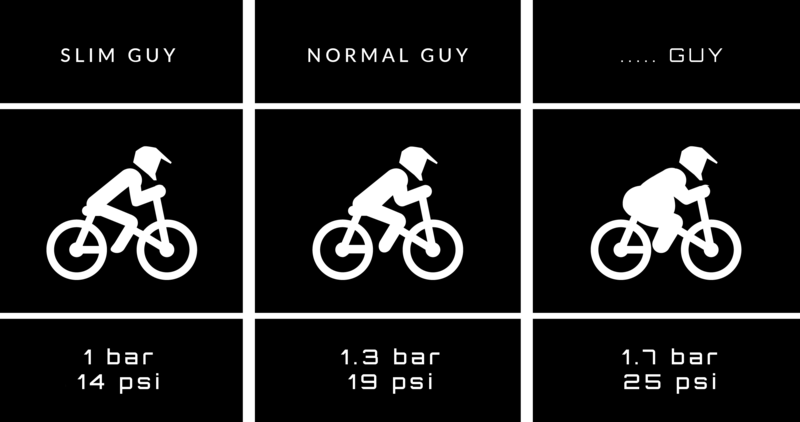 The air that is normally used in the Tubeless system or in systems available so far has a naturally elastic behaviour. With air systems a large impact in compression will give an explosion/elastic rebound in an equal and opposite direction. On the contrary, Banger provides a shock-absorbing effect which will notably increase your performance and your confidence. Your bike suspension is already able to damp impacts with low frequency and large amplitudes, but can never guarantee such high sensitivity on rugged terrains with small and frequent unevenness. Banger, which is directly in contact with the ground together with the tire, adapts itself and absorbs all bumpiness quickly, thus ensuring unprecedented buoyancy and a smooth ride. Rolling Resistance? We Manage it! You would be wrong to think that Banger worsens bike rolling resistance. Tests performed by WheelEnergy Oy, the most important independent laboratory in the world for bicycle tire testing, clearly demonstrate that the wheel set maintains its rolling resistance characteristics in offroad use. This means a wheel set which is still fast, just like with air systems, but can guarantee new riding sensations and an absolutely exceptional grip. With Banger you needn’t be afraid of using lighter rims and tires. In fact, Banger not only protects the rim, but also ensures the stability and precision that only a multi-layer casing can provide. So, Banger can not only guarantee improved rolling resistance and buoyancy, but could also help you to save weight! Change your perspectives, leave your worries behind you and enjoy your mountain bike lines with peace of mind. Banger is fully customizable thanks to its compatibility with tubeless systems. This means you can customize the response of your wheel set thanks to the presence of about 5% air according to track conditions and your riding style. A versatile system, suitable for any type of tire and rim shape. A system that won’t leave you standing even if 5% of the air is missing. An absolute guarantee for races as well as for trips with friends. Banger works in harmony with your tire controlling its deformation and improving its response on any terrain both in compression and rebound. Our techno-compound is able to absorb and dissipate shock, concretely and considerably reducing the amount of vibration transmitted to the rider. Banger also drastically reduces the risk of damage to rims. Our polymer, in fact, always ensures significant support inside the tire even during the most violent impacts. Thanks to Banger it is impossible to hit the rim against a rock or cut the tire casing by pinching it against the rim. Banger appreciably increases support and road holding during cornering even during violent compressions and changes of direction. With traditional air (or dual chamber) systems lower tire pressure can increase comfort, but has a very negative effect on the support that the tire casing provides to the rider, especially on bends and during compressions. Banger, which substitutes 95% of the air, is able to provide support to the tire casing even with extremely low pressures. This means that the control and stability of the bike are excellent when riding straight as well as cornering even with extremely light tires and single-ply sidewalls. In addition, its support and the volume it provides inside the tire result in an almost complete anti-burping guarantee. Banger works from inside the tire maintaining the tire bead stably close to the rim profile even during the most violent impacts or changes of direction. The first thing that people tell us before trying Banger is that its weight will affect wheel set rolling resistance. Physics tells us that this is wrong and is based on false myths about the forces acting on the wheel set. First of all, Banger allows the use of much lighter tires with lower rolling resistance which tend to require lower pressures. The elastomeric compound, combined with the virtual absence of air inside the tire, not only ensures improved rollover and buoyancy over any kind of obstacle but also the conservation of momentum. This means that the wheel set maintains amazing characteristics of responsiveness and rolling resistance. Banger uses a techno-polymer which is totally innovative world-wide to date. When we first discussed the project with our engineers, they told us that we were completely crazy: “It’s impossible to reach such low densities while maintaining the required elasticity, shock absorption and durability features.” Well, today, after 5 years of development we are very proud to present the impossible on the market! A techno-polymer that astoundingly maintains its elastomeric characteristics. Finally, we have studied and developed a “skin” to our product which is both waterproof and compatible with tire sealant. We did not use a material ordinarily available on the market; instead we specially developed a polymer that would meet mountain bike requirements. We could have created Banger with extremely lightweight materials, but this would have had a negative effect on the performance and durability of the product. Banger is suitable for any type of user, from amateurs to professionals, and is available for all formats currently on the market. Banger is available in diameters 26″, 27.5″ and 29″ and in 4 different sizes: XC, Enduro/Trail, Downhill and eBike/Plus. MrWolf will recommend a base pressure as a starting point with your setup. 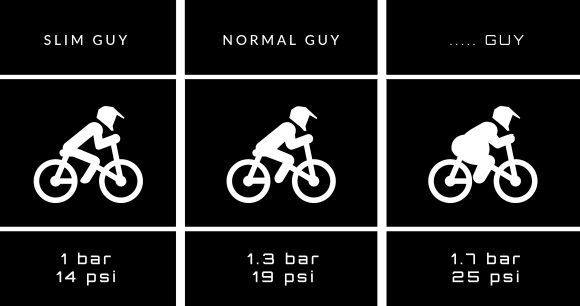 Nevertheless, the air pressure varies according to the type of usage, bike, rider and tire used. Just by changing the pressure by 0.1 bar/2 psi you’ll perceive enormous changes in Banger’s behavior. How long does Banger last? Banger is a product subject to stresses and, consequently, to wear. How long it lasts depends on the type of usage and rider. Our testers used Banger for up to a year without finding serious problems due to wear. Should I continue using tire sealant? It’s your choice. Some riders prefer to eliminate tire sealant completely for practical reasons, while others continue to use it to maintain tire pressure better. Banger’s skin is compatible with tire sealant so you’ll only have to do your usual maintenance procedure. Should I replace my valve?No, your valve is already perfect for use with Banger. Just slip our “T” reduction inside your valve to ensure perfect compatibility with Banger.